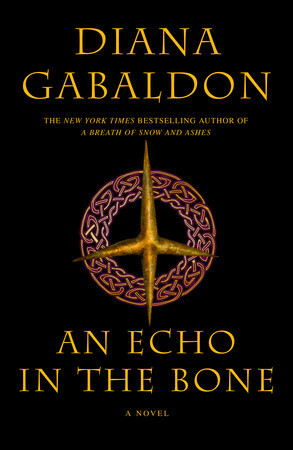 This week marks three years since Diana Gabaldon's novel AN ECHO IN THE BONE was published. Diana often comments that readers' reactions change over time. For those of you who read ECHO when it was first published in 2009, I was just wondering whether your attitudes toward the book have changed at all, in those three years, and if so, in what way, and why? Are there parts of the book that you enjoy more on subsequent re-reads than you did at first? What do you think of William, Rachel, Denny, and Dottie? And has your reaction to any of these characters changed since you first read ECHO? Are there any scenes in ECHO that you skip over on re-reading? And if so, why? Has your response to the Claire/Lord John subplot changed at all since you first read that part of the book? If so, how, and what caused it to change? These are just some suggestions to get you thinking; feel free to add your own ideas! PLEASE NOTE: I don't read excerpts or #DailyLines from WRITTEN IN MY OWN HEART'S BLOOD (Book 8, aka MOHB or MOBY), so please don't refer to excerpts or #DailyLines in your comments. Thank you. I have read Echo twice and really enjoyed it both times; I found that the cliffhangers were/are difficult, but realize that in such a huge book with so many divergent stories, how in the world could she end it any other way? I find myself looking forward all that much more to MOBY. I do read the Daily Lines and enjoy them and all the comments! As far as Echo goes, I loved getting to know Denny and Rachel. I really disliked the scene where they are traveling with William and come across the couple who attack them; very disturbing. But, all the detail and research Diana does is fascinating and makes her writing so much more. I do love how well known historical people walk through the story; I'm looking forward to hearing more about Benedict Arnold (assuming, of course, he shows up again!) George Wahington, too. The Claire/Lord John subplot was and is an interesting one that I think will have even more impact in MOBY. So many possible repercussions. The despair of both was so palpable, the course of the story at that point seemed reasonable, even though it you didn't really want it to happen. But comfort is necessary and they found it where they could. Very interesting question. The first time I read Echo, I didn't like it. I wanted more Jamie and Claire and less secondary characters and less bits about the war. The second time I read Echo, my thoughts were completely different. I loved it. I think there is a lot to be said about re-reads. So much I missed because I did skim over some of the boring parts that I just didn't find boring the next time around. Diana's books are so full of detail that I find it next to impossible to _skim_ them. The historical, cultural,and scientific details are so well researched and woven into her plots, and sometimes I need to go deeper into the background, to read more elsewhere. Claire and John? It was a very risky thing he did, considering the time (1778)and place, marrying Claire, and yet so very typical of the gallant John. As he said: the last thing he could do for his friend. What I find interesting is that John really doesn't know just how old Claire is. He was about 16 when they first met and she set his broken arm, back in 1745. Claire was then 27, assuming that time difference of 202 yrs still holds. She was born 1918...or 1716 depending on _when_ she is. At River Run in 1770 (DOA) when Claire checks his trepanned skull, he figures she has to be at least 40, when she is really almost 54. Claire's life in the 50s and 60s Boston helped keep her healthy for the life in Colonial times, so she was a still a fine looking woman in her 62nd year, when she married John. I firmly believe that the three will remain friends. Each one has plenty of integrity and guts. I always get print and audio of each book so I think I've read/listened to Echo 4 times now, and caught up on all Lord John novels as well. I adore LJG more with each new story. I am very over the Lord John/Claire stuff and always admired him for protecting her. I hope Jamie doesn't hurt him too much :) Of course Jamie and Claire capture my attention best, but I'm enjoying the other stories, most especially the Ian/Rachel/William triangle. I'm still sad about Roger and Bree leaving the 18th cent and am very curious about their story arc. I do read Daily Lines and so look forward to MOBY! I've read the whole series three times (including the Lord John novels the last time around) in their 'proper' chronological sequence, which, for me, means pausing during the reading of 'Voyager'...and I find myself increasingly aware of the internal consistencies of the series. Having said that, I'm bound and determined not to start again until MOBY is published. There are quite a , few 'echoes' in 'Echo in the Bone' - not the least of which is Claire being married - again - to save her serious unpleasantness at the hands of His Majesty's finest. Sure was consistent with old John being able to think on his, er, feet. But does that episode 'echo' the encounter between Jamie and Mary McNab? I do think Ms. Gabaldon captures that whole young adult hormone thing REALLY well, too. I'm excited to re-read Echo soon (I just discovered Outlander last Christmas and read the whole series right away, working on my first reread and nearly done with FC now). When I read it the first time I was less interested in the William time but now that I've read all the LJG books and watched him grow (and Jamie as a father) a little more I think I'll appreciate them more! I was a shocked as anyone by the Claire/Lord John developments but feel like it was true to their characters and have really learned to admire and even love John. I can't wait to reread this even though I know the waiting is going to be even worse once I finish!